Vegan Butternut Squash Risotto is the perfect fall meal! This savory dish is gluten free and vegan, yet it is so creamy, you will think that it must have dairy! Butternut squash risotto a great Thanksgiving dish! Everyone loves it, not just the vegans, and it is free of all common allergies, so almost anyone can it! Risotto is a creamy dish made with a special type of rice called Arborio that gets creamy when you cook it the right way. Make sure to use the arborio rice in this recipe or it won’t come out right. Do I have to use wine in the risotto? No, it’s traditionally made with white wine, but to make it more kid friendly, I give an option to exclude the wine. My husband and I love the flavor with the wine in it, but my kids hate it. Although the alcohol cooks out, it does have a flavor that kids aren’t used to. When I omitted the wine, my kids gobbled it down! How do I roast the butternut squash for the risotto? Start with roasting the squash because this will take the longest. 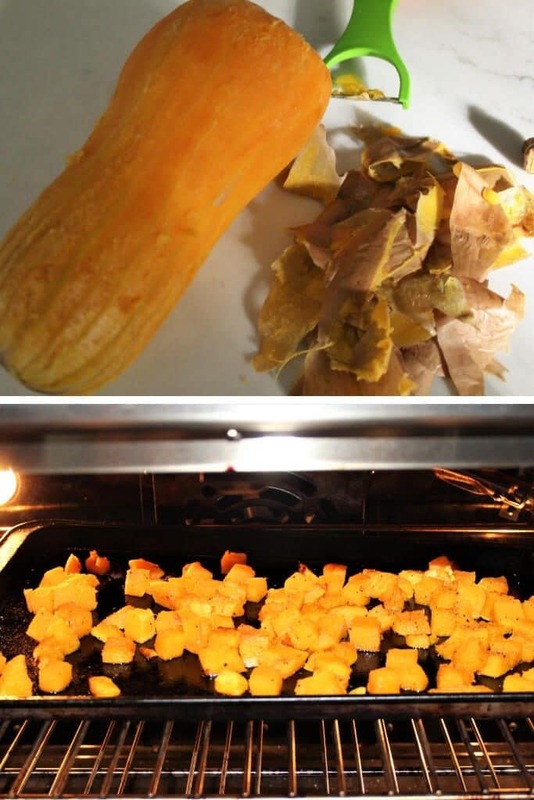 Just wash your squash, and put the whole thing in the oven at 300 degrees for about ½ hour. Take it out and let it cool for about 5-10 minutes, until you can hold it without getting burned. Use a peeler to easily peel off all the skin. Then cube it into bit sized pieces, making sure to throw away the seeds and stem. Next, put the squash on a cookie sheet, drizzle with some olive oil, sprinkle with salt and pepper, and bake at 375° F for about another ½ hour until it is soft all the way through and a little crispy on the outside. Flip it with a spatula about every 10 minutes. (If you don’t pre-bake the squash, you will need to cook it for about 45-50 minutes). Note: You can peel and cube the butternut squash in its raw state if you are strong and have a very sharp knife, however, I prefer to bake it a little first to make it easier to peel and cut. How do I make vegan butternut squash risotto? While the cubed squash is baking, heat vegan butter (I like to use my butter recipe) margarine in a pot on low until it melts. Add 4 gloves of minced garlic and allow the garlic to warm in the butter for a few minutes. Pour in the dry arborio rice and stir until it is coated in the margarine and turns slightly translucent. Add the white wine if desired, or simply the first ½ cup of broth, and stir slowly until nearly all the liquid is absorbed. Add the remaining 6 cups of broth mixture ½ cup at a time, stirring frequently and adding more as soon as the liquid is absorbed. Once you have used up all the broth, add the baked squash and fold the squash into the rice. Don’t stir too much or you will mash the squash. You may want to pour yourself a glass of that white wine and talk to a friend while you make this vegan roasted squash risotto. It doesn’t take much brain power to make, but you can’t walk away from this dish! Be patient, cook the rice over a low heat and slowly add the broth for a creamy risotto. It’s delicious with vegan Parmesan sprinkled on top! You can make your own dairy free Parmesan cheese using my quick and easy nut free recipe. Did you make this butternut squash risotto? 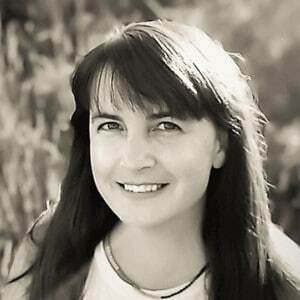 Leave a comment and let me know what you think! A creamy vegan risotto with butternut squash and sage. Wash the squash and place it in the oven at 300 F for about 30 minutes until it becomes slightly soft. Take out and let it cool until you can hold it. Then peel and cube the squash. Place cubes on a cookie sheet and sprinkle with olive oil, salt, and pepper. Bake the cubes at 375° F for an additional 30 minutes, flipping with a spatula every 10 minutes until slightly crisp on the outside. Make 6 cups of broth by pouring 6 cups of water into a pot with 3 bouillon cubes of Not chick’n and add a tablespoon of poultry seasoning to the broth. Heat and stir until the broth cubes are dissolved. While the cubed squash is baking, melt vegan margarine on low in a large pot. Add minced garlic and let it warm for about 3 minutes in the margarine. Pour in 2 cups Arborio rice (dry unwashed) and coat the rice with margarine and garlic. It will turn slightly translucent. Add the wine (or ½ cup of broth) stir until it absorbs. Add remaining 6 cups of broth mixture about ½ a cup or 1 ladle full at a time. Stir slowly and constantly adding more each time the liquid is absorbed. When all the broth has been used. 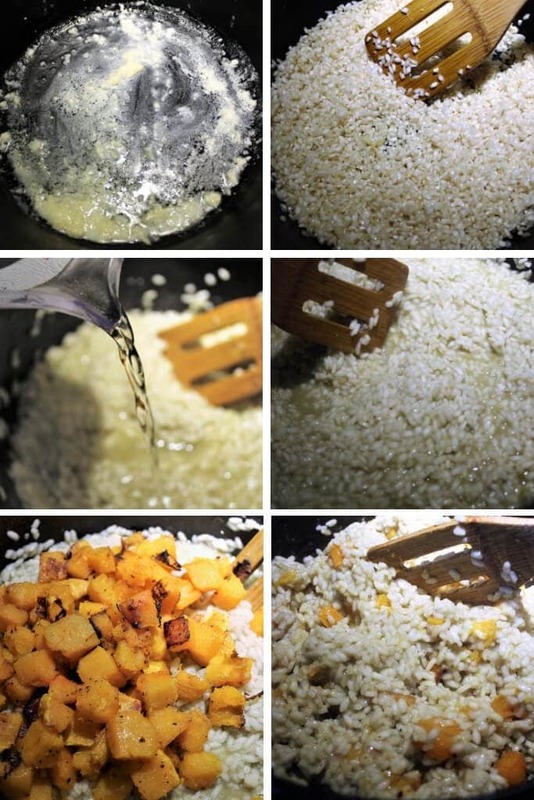 Add the roasted squash to the rice and stir carefully until mixed. Make sure to add the broth slowly stirring between each scoop of broth. You can peel and cube the squash without pre-cooking, however it will be very hard to cut. It will also need to bake a little longer on the cookie sheet. Squash baking time with vary depending on the size of the cubes. Just made this! It was delicious! I’m going to have to make this again for Thanksgiving this year!